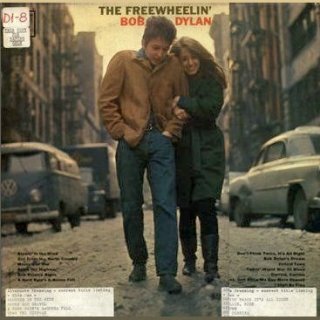 For information about and stereo releases of this album, see International Album Releases (Regular). 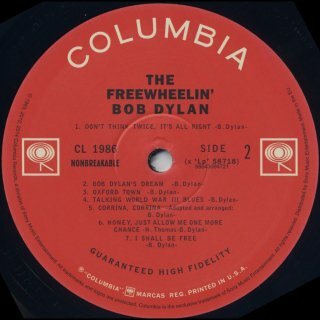 The accepted release date of the commercial album is 27 May 1963, although it's odd that the withdrawn album is listed in a Columbia Records release schedule for July 1963. 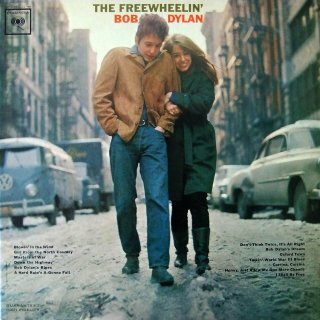 For full details of the withdrawn original album with four replaced tracks, see 1963. 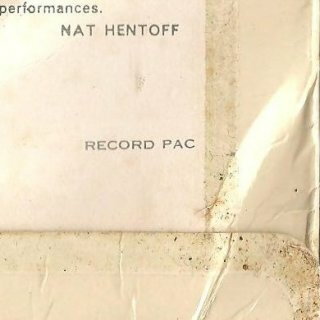 For a picture of Nat Hentoff's notes for the withdrawn album, also see 1963. 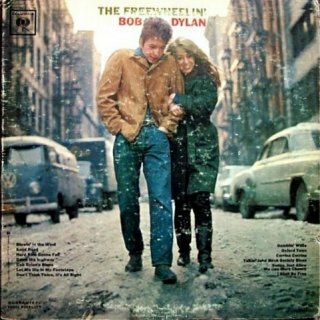 The front sleeve photo of Bob and his then girlfriend Suze Rotolo (who sadly died in Feb 2011) was again taken by Don Hunstein, on Jones Street in Greenwich Village, New York City, which joins up with the notorious 4th Street at its eastern end (actually West 4th Street at this point). Thanks to Eric Baumel for confirming the location and to Bill Hester for further information. 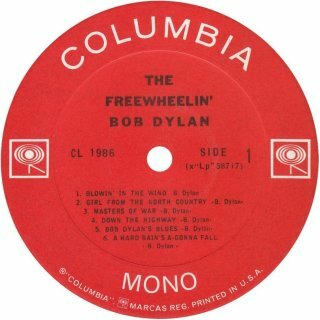 Columbia CL 1986 (USA), note sent out with promo copies about bands 3 and 6 on Side 1 being reversed - scan by Hans Seegers. 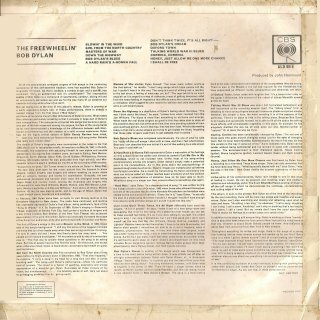 The note actually refers to the withdrawn album, but was sent out with the replacement album! 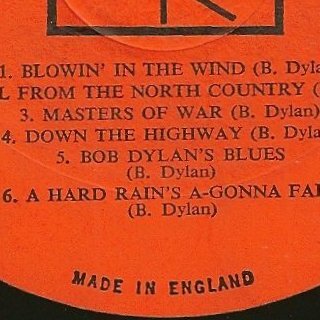 The rear sleeve of Hans Seegers' promo copy with the withdrawn tracks has a "1" at bottom right. 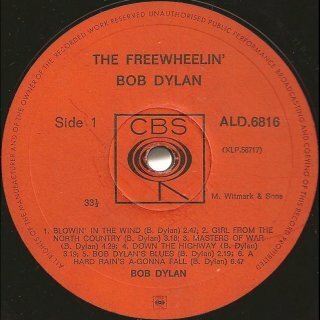 This indicates the sleeve was made by Modern Album Finishing Co., probably at their Terre Haute, IN, facility. 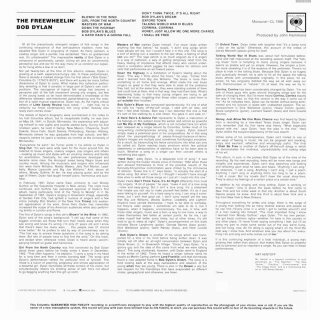 The promo copy of the regular album shown here has the original sleeve but the front has typewritten revised track listings stuck over the printed titles. 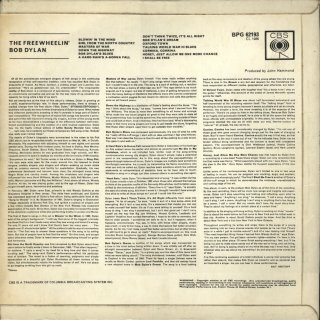 The rear sleeve has both mono and stereo catalogue numbers at top right (same as commercial release variant 1 below) although the front sleeve has "MONAURAL". 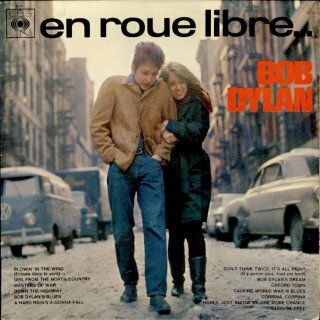 Thanks to Jean-Pol Hiernaux for finding the two copies from Suze Rotolo's personal collection for auction at Christie's, New York, in Nov 2006. 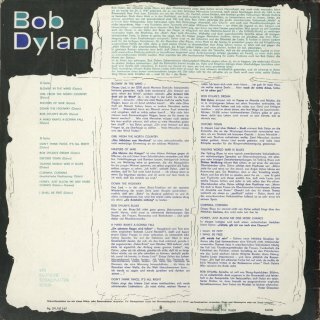 The first copy is a white label promo listing the replaced tracks hand-corrected by Bob, the second has handwriting by Bob of "To every Body" on the back and also has Suze's name "Susan Rotolo" at top right. 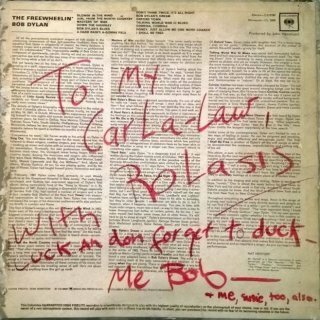 Thanks to Emmanuele Orrú for the scan of the copy formerly owned by Suze's sister Carla (whose spectacular falling-out with Bob was chronicled in Ballad In Plain D from Another Side Of Bob Dylan), and signed on the rear by Bob. Carla moved to Sardinia, Italy, where she died in 2014 at the age of 73. This album was inherited by a woman who used to care for Carla, and is now owned by her granddaughter. 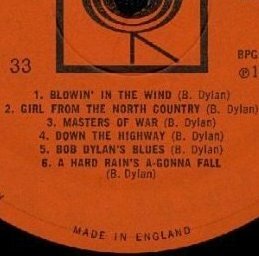 Thanks to "Truman Peyote" for information about a promo copy with the timing strip showing the withdrawn tracks which looks as if someone has tried to remove the strip at some time! Jean-Pol Hiernaux also found a picture which shows a timing strip with the withdrawn tracks that also looks as if someone has tried to remove it. 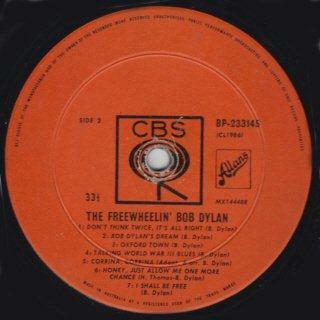 The record inside is actually the regular white label promo as shown in the scans by Hans Seegers. 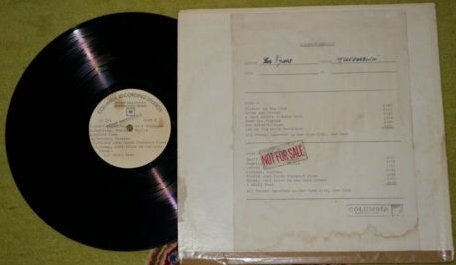 Gerd Rundel has a white label promo copy with a timing strip in better condition. 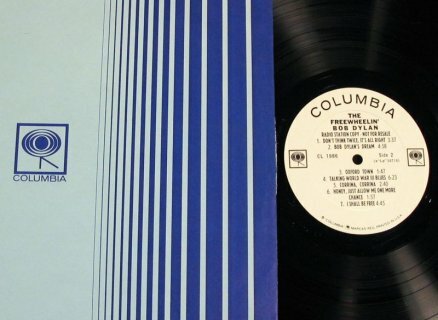 It comes in the same original blue design Columbia inner sleeve as Truman Peyote's copy, and again has a “1” at the bottom right hand corner of the rear sleeve. 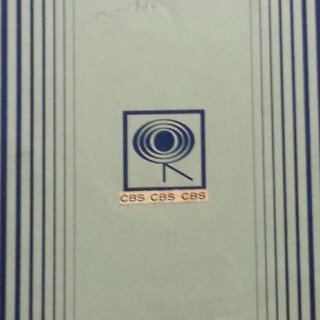 This copy has stamped matrix numbers: Side 1 - XLP-58717-3A, Side 2 - XLP-58718-2A. 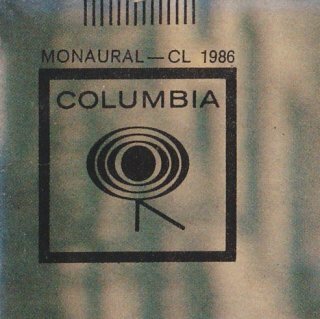 Columbia CL 1986 (USA) - front scan by Gerd Rundel (release with withdrawn tracks) Gerd Rundel's commercial copy looks in every way like the first commercial release with a record with "GUARANTEED HIGH FIDELITY" labels, although it plays the withdrawn tracks. 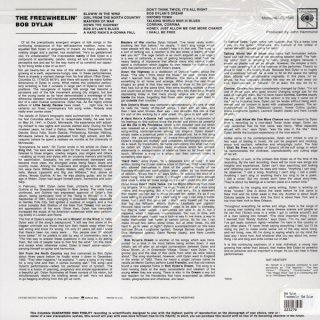 The sleeve has the replacement track listing on front and rear. 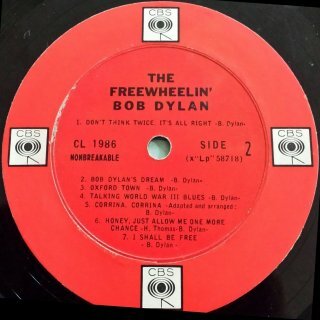 The "6" on the rear sleeve at bottom right indicates that the sleeve was fabricated by Imperial Paper Box Corp. of Brooklyn, NY. 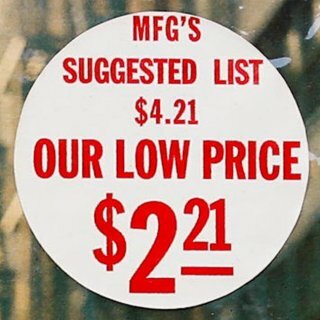 (Imperial Paper used even numbers.) 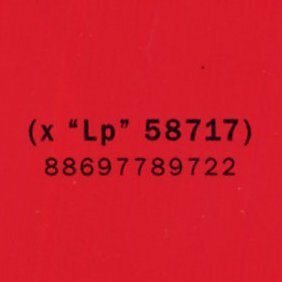 Matrix numbers for the withdrawn mono album with commercial red labels are: Side 1 - XLP-58717-1A, Side 2 - XLP-58718-1A, see detail scans below. 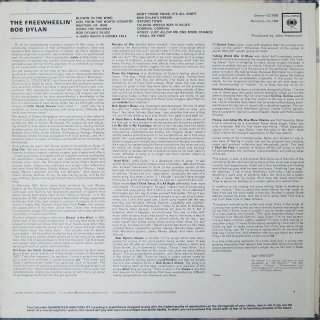 The rear sleeve of the withdrawn release copy is the variant with both the mono and stereo catalogue numbers at top right - variant 1 below. 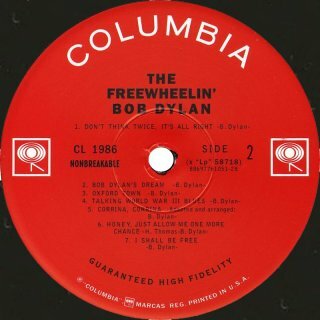 The red Columbia commercial record label occurs in two designs: the first commercial release has "GUARANTEED HIGH FIDELITY" and the second commercial release has the "MONO"/"360° SOUND"/arrows logo, see below. 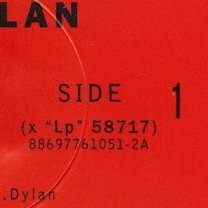 It appears that copies with both label designs can occur in sleeves with both rear designs, as shown in the detail scans! 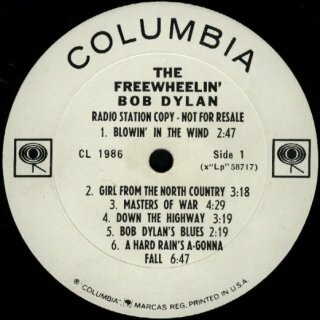 Gerd Rundel has a copy of the first commercial release with a sticker advertising Blowin' In The Wind on the front sleeve. 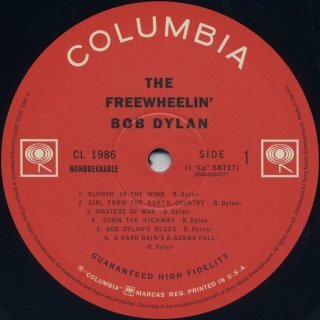 The record is in a grey/white Columbia inner sleeve and has "GUARANTEED HIGH FIDELITY" on the labels with stamped matrix numbers: Side 1 - XLP-58717-3L, Side 2 - XLP-58718-2A. 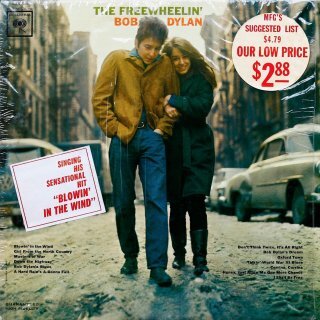 Gerd's second copy has two stickers on the front sleeve, the second sticker showing a reduced price of $2.88. 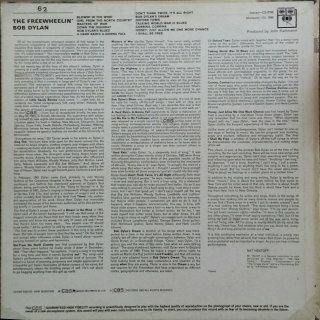 The rear sleeve of this copy has a "6" at bottom right. 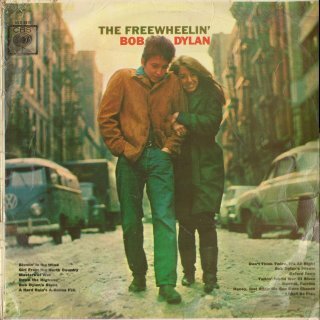 This indicates the sleeve was originally made by Imperial Paper Box Corp. of Brooklyn, NY. 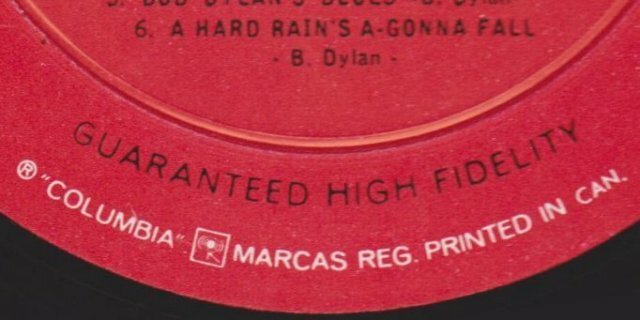 The record again has "GUARANTEED HIGH FIDELITY" labels. 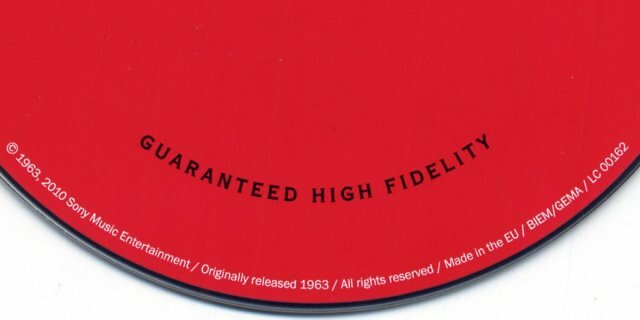 Tim Norford has a copy of the same album with the "GUARANTEED HIGH FIDELITY" labels where the matrix numbers are Side 1 - XLP-58717-3K (stamped), Side 2 - XLP-58718-2L (handwritten). 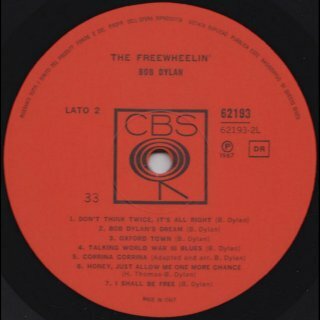 This copy has a "3" at bottom right of the rear sleeve. 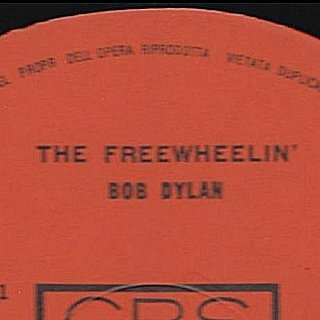 This indicates the sleeve was made by Modern Album Finishing Co., probably at Terre Haute, IN. 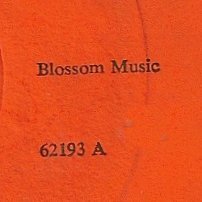 Another contributor has a copy where the record has stereo labels but has mono matrix numbers: Side 1 - XLP-58717-3D, Side 2 - XLP-58718-2B. 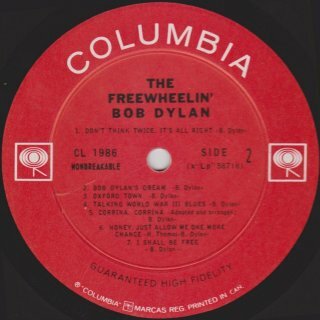 The very worn record store copy illustrated by a Side 2 label with a "DEMONSTRATION" sticker appears to have "COLUMBIA" in black but on closer examination the "COLUMBIA" logo has been partially inked in black pen! Thanks to Joe Ferrari for pointing this out. Some first release copies come with the grey or blue striped inner sleeves shown, but others have a monochrome picture sleeve with illustrations of contemporary album from Columbia Records on the front and record care advice on the rear. 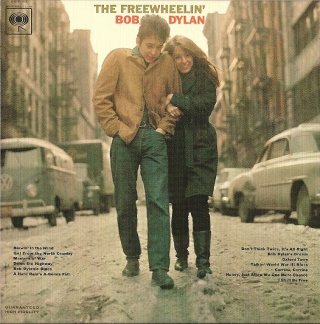 The album was also released with an exclusive mono rear sleeve (variant 2) that listed only the mono catalogue number at top right. 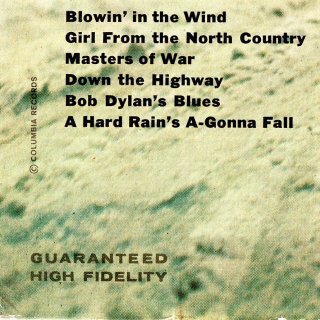 This copy found on eBay by Gerd Rundel, again with "GUARANTEED HIGH FIDELITY" labels as above, has three stickers on the front sleeve, the second sticker showing a reduced price now of $2.21. 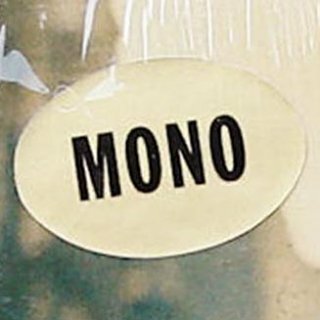 I find the "MONO" sticker very confusing. 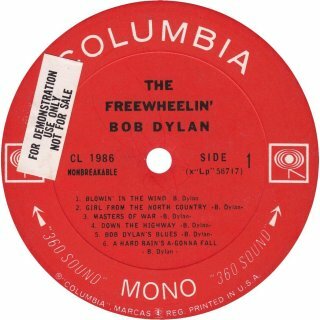 I lived throughout the 1960s and I never saw a mono album with a “MONO” sticker! 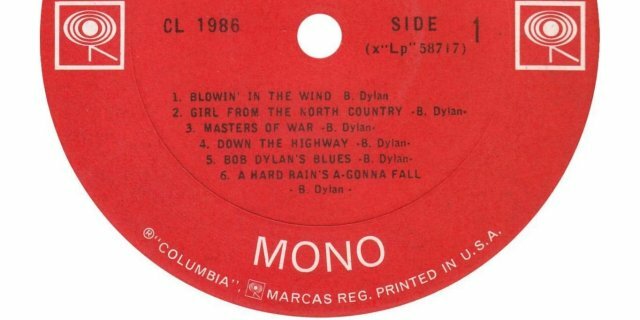 Even by 1965, mono albums were the majority. 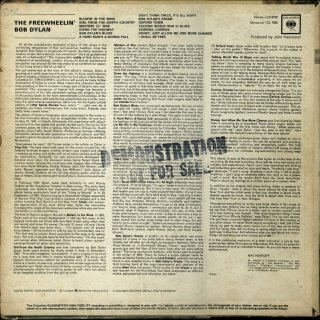 I did not hear a stereo album until 1967-68. 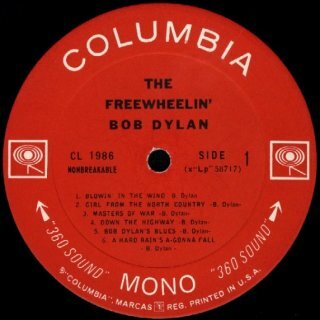 There was no need for “MONO” stickers. 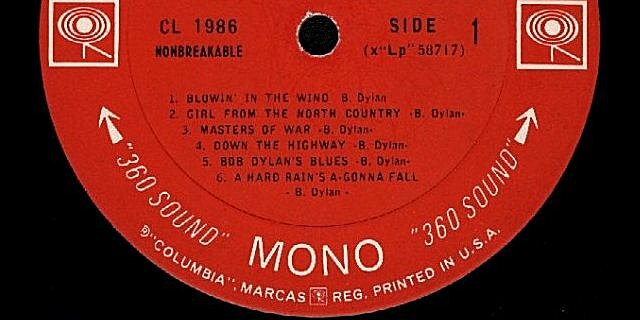 Maybe they might highlight “STEREO”, the new innovation, but not mono. 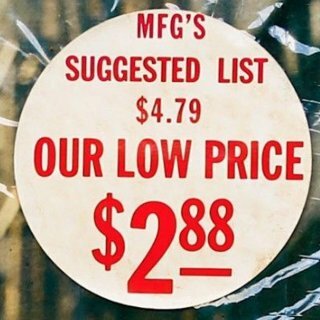 The price sticker might be genuine. 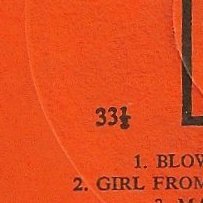 This copy has a rear sleeve with just the mono catalogue number on the rear, with a "3" at bottom right. 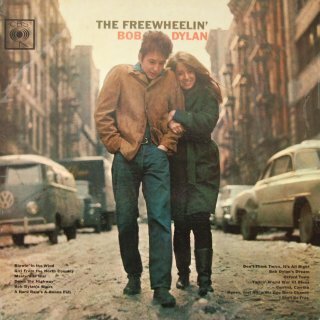 This again indicates the sleeve was made by Modern Album Finishing Co., probably at Terre Haute, IN. 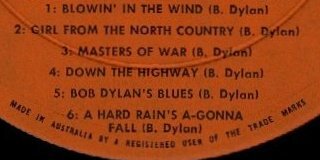 I have also shown a different Dylan album cover from the same eBay seller with a similar price sticker and the same suspicious "MONO" sticker. 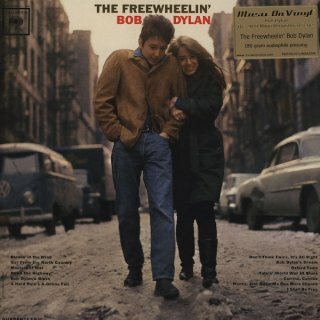 I suspect the Freewheelin' album is genuine but possibly two of the front stickers are not. 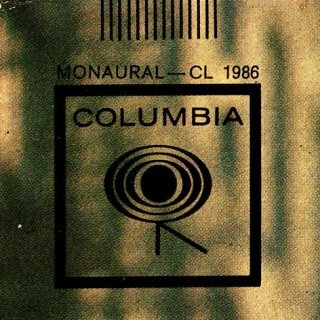 Columbia CL 1986 (USA) - Side 1 scan by Hans Seegers (second mono commercial release - "MONO", "360º SOUND"/arrows) The second Columbia commercial record labels have the "MONO"/"360° SOUND"/arrows logo instead of "GUARANTEED HIGH FIDELITY". 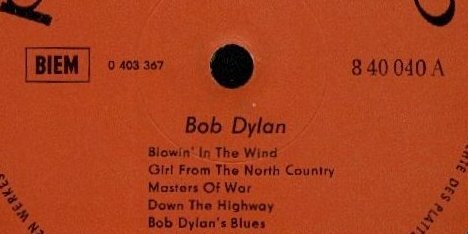 It appears that copies with both label designs can occur in sleeves with both rear designs. 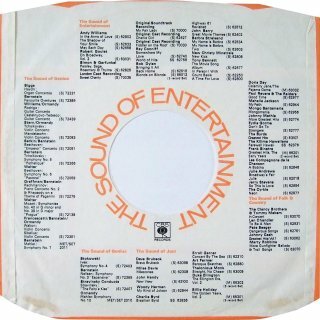 Gerd Rundel has a copy in the commercial release variant 1 sleeve, again with a "1" at rear bottom right where the record has second release "MONO"/"360° SOUND"/arrows logo labels with a white demonstration sticker on Side 1. 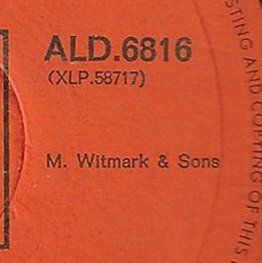 This record has stamped matrix numbers: Side 1 - XLP-58717-3AD, Side 2 - XLP-58718-2AC. 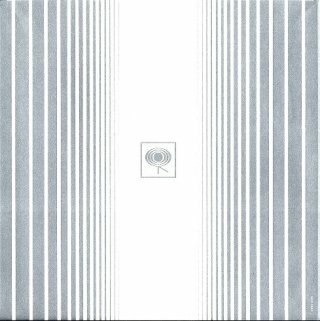 Jennifer Siedenburg has a copy in the commercial release variant 1 sleeve, with a record with second release labels and stamped matrix numbers: Side 1 - XLP-58717-2J, Side 2 - XLP-58718-3G. The sleeve of this copy has a "6" at rear bottom right, which again indicates it is a sleeve originally made by Imperial Paper Box Corp, Brooklyn, NY. 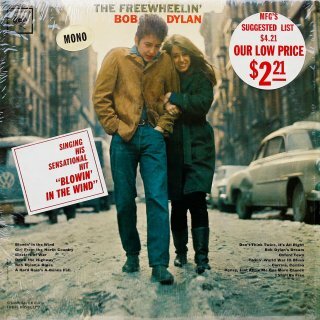 Mitchell Cutler has a copy in the commercial release variant 1 sleeve and the second release labels. 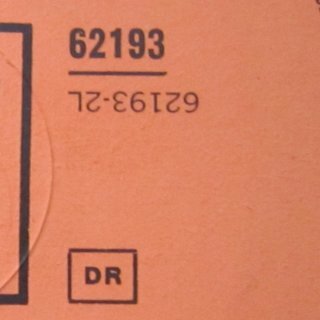 This copy has stamped matrix numbers: Side 1 - XLP-58717-3C, Side 2 - XLP-58718-2AC. 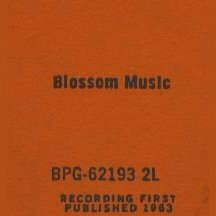 Nick Viani has a later copy with second release labels, again with a "6" on the rear sleeve at bottom right. 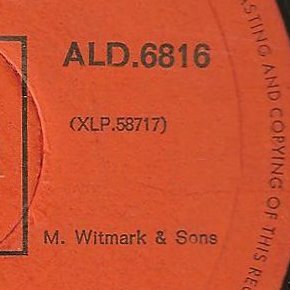 This copy has stamped matrix numbers: Side 1 - XLP-58717-3AE, Side 2 - XLP-58718-2J. 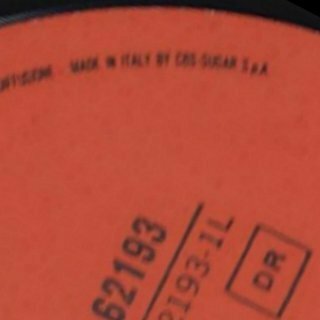 Also, directly opposite from the matrix number on Side 2 is a small hand engraved "SM" (the pressing plant at Santa Maria, CA) and what appear to be four vertical lines with a horizontal line through them. 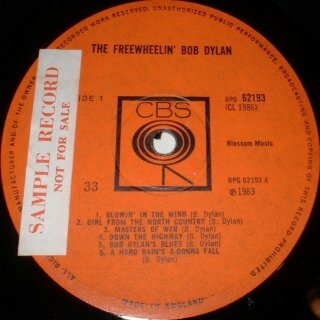 Gerd Rundel has another copy in the commercial release variant 1 sleeve, again with a "6" at rear bottom right, where the record now has third release "MONO" labels, dating from around 1968 - US mono copies of John Wesley Harding were the first to have this style of labels on first release. 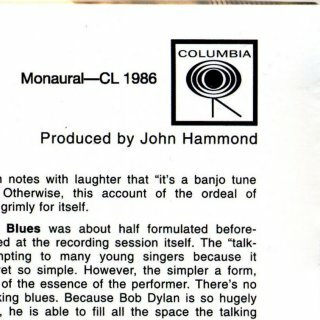 The "360° SOUND"/arrows logo on either side of "MONO" is missing from the bottom of the labels, as is "NONBREAKABLE" to the left to the centre hole. 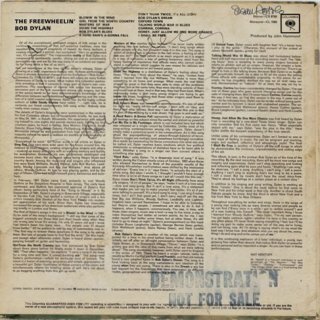 This record of the copy shown has stamped matrix numbers: Side 1 - XLP-58717-3K, Side 2 - XLP-58718-2J. Thanks to Hans Seegers, Ole Lien, Gerd Rundel, Arie de Reus, Jean-Pol Hiernaux and "Truman Peyote" for information and pictures. 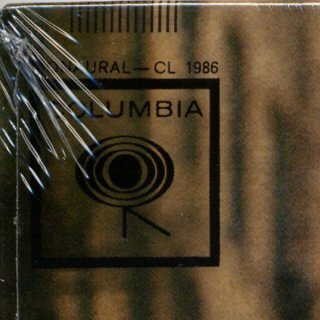 Columbia CL 1986 (USA for export) - front with "CBS" stickers top left and bottom left, photo by Rob Rioux This mono export copy of CL 1986 was discovered in Oregon, USA, and had belonged to a man who had worked in the record industry, so probably never left the USA. 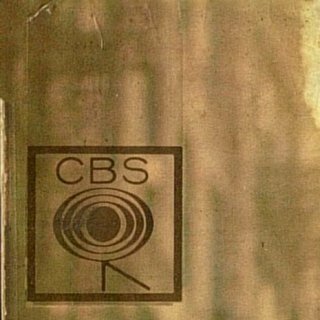 The front sleeve has three "CBS" logo stickers covering "Columbia" at top left, and a text "CBS" sticker covering "Columbia" at bottom left. 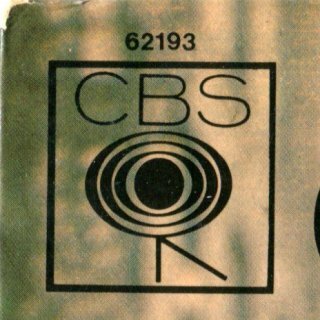 The rear sleeve has two "CBS" logo stickers covering "Columbia" at top right, and a three text "CBS" stickers covering "Columbia" on the two bottom text lines. 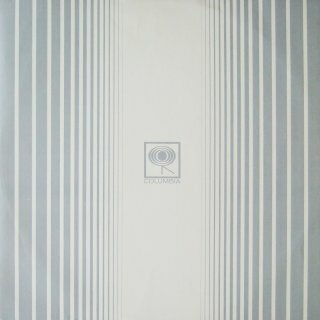 The inner sleeve is the expected Columbia US design, white with blue vertical stripes. 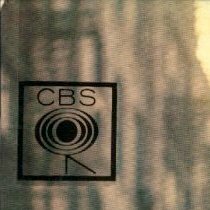 It has three text "CBS" stickers covering "Columbia" in the centre on both the front and back. 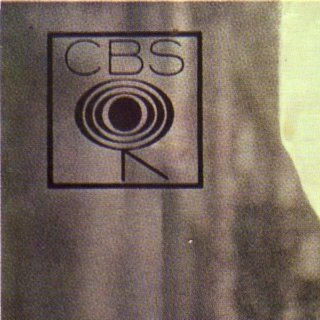 The record, which is almost certainly the second commercial release, has red ring-shaped stickers with four printed "CBS" logos. 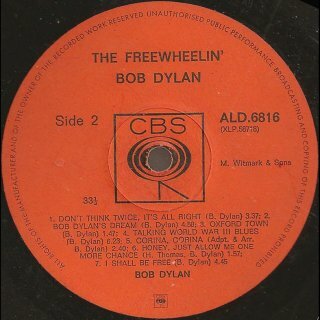 This copy has stamped matrix numbers: Side 1 - XLP-58717-3A, Side 2 - XLP-58718-2A. 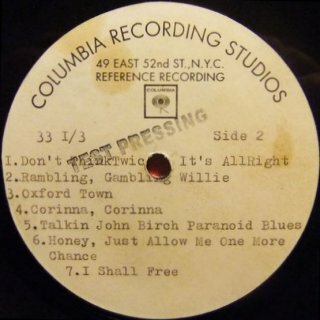 I also have scans of an export Columbia US mono copy of Bringing It All Back Home with similar sleeve stickers and the same record label stickers. Thanks to Rob Rioux for information and photos. Sundazed/Columbia LP 5115 (USA) - front scan by Hans Seegers New York State-based small label Sundazed gained approval in 2001 from Columbia to reissue the 1960s Dylan album in the original mono on 180gm vinyl. 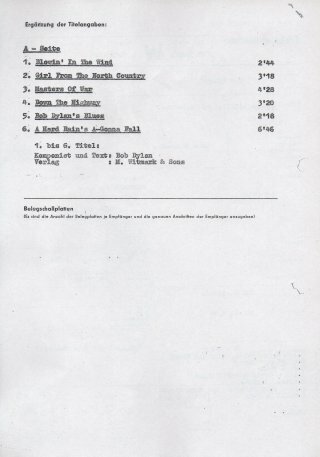 Thanks to Ole Lien for information on this item and to Hans Seegers for scans. 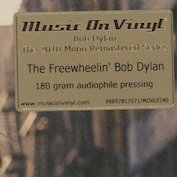 The copy shown is still sealed - thanks to Robert Kornovich for photos of the labels, which reproduce those of the final mono release with the "STEREO"/"360° SOUND"/arrows logo in white (see above). 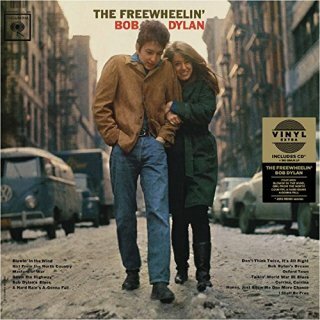 This heavyweight vinyl mono release is part of the LP version of the 2010 9CD set The Original Mono Recordings, see International Album Releases (Multi-Packs) 2010s, sold separately. The record labels reproduce the style of the original 1963 mono labels. 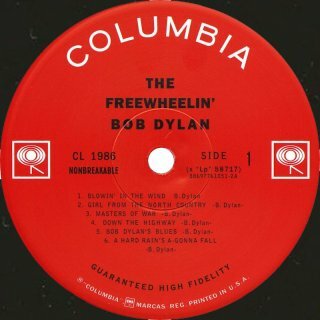 As well as "CL 1986" the record sides are also numbered "88697761051-2A/B". 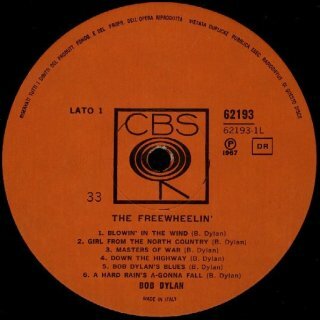 This album was also sold in Europe by the Dutch company Music On Vinyl as MOVLP 240. The copy shown has a gold Music On Vinyl sticker on the front sleeve and a white sticker with a barcode on the rear sleeve at bottom right. 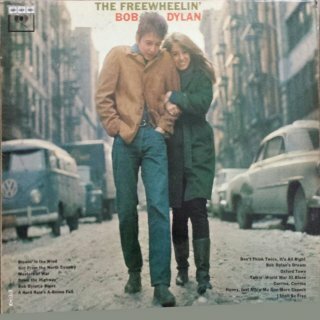 Record and sleeve photo from eBay This at first convincing "test pressing" with the withdrawn tracks for auction on eBay from an Italian seller is actually a fake. 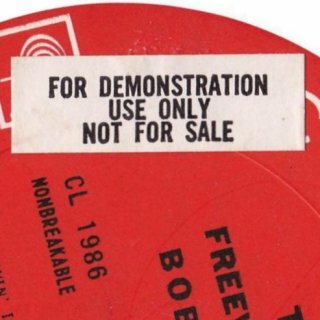 The information sheet glued to the white card sleeve is nothing like a Columbia US information sheet of the time, and labels like these were not used for test pressings. 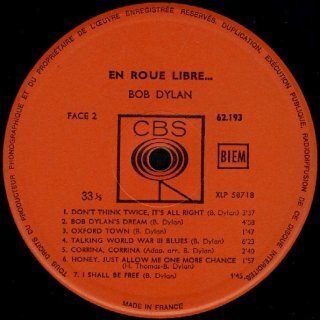 Thanks to Renaud Depierreux for information about this item, and to Jeff Gold of Record Mecca, Arie de Reus and Hans Seegers for confirming it's a fake. 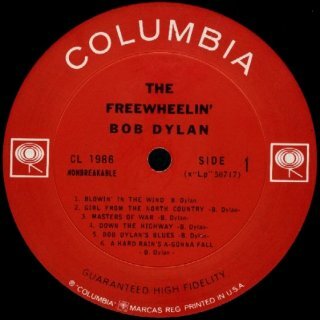 Columbia CL 1986 (Canada) - front picture from eBay The front sleeve of the Canadian mono release of The Freewheelin' Bob Dylan, Columbia CL 1986, had in error the withdrawn track listing, see 1963. 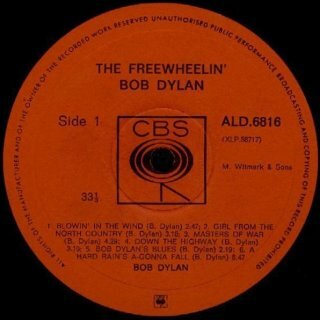 However, the record inside was the regular release. 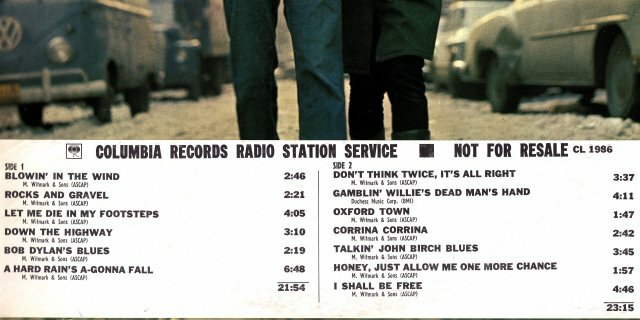 The rear sleeve had the revised track listing but with only 12 songs listed, omitting Don't Think Twice, It's All Right even though it was on the album. 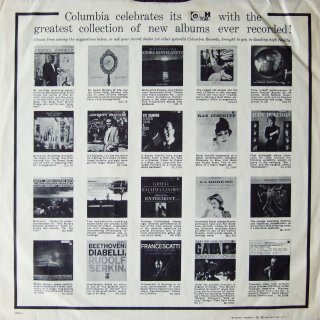 You might think this too would be a very collectable item, but in fact Columbia Canada used the same sleeve for the LP until 1975! Thanks to Hans Seegers and Gerd Rundel for information and scan. 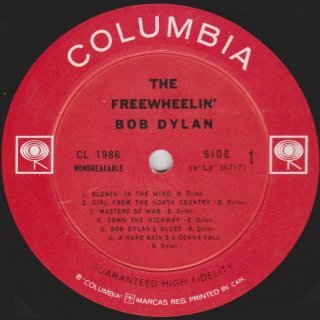 My original UK mono copy of The Freewheelin' Bob Dylan was sadly stolen in 1968! 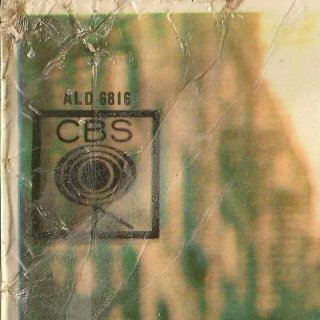 CBS BPG 62193 (UK) - front scan by Hans Seegers (first CBS copy) Note the front picture is a higher crop of the source photo than the US front! (More sky above Bob's head, less road below his feet.) 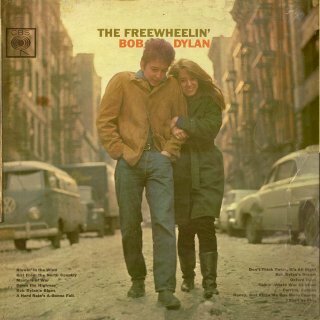 It's actually the stereo front sleeve but without the stereo logo above the title. The rear sleeve has three folded-over flaps. 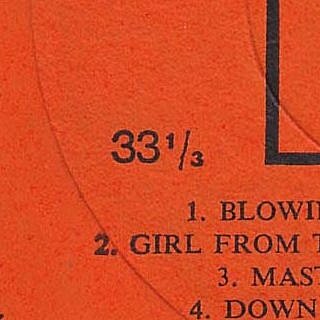 The record has textured ("rough") orange CBS labels with the playing speed shown as "33". 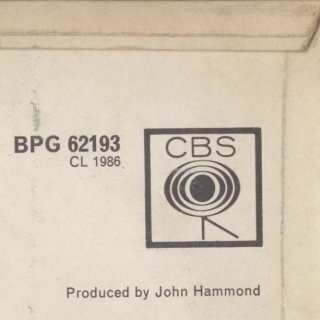 The catalogue number on the record labels is shown as "CBS bpg 62193". 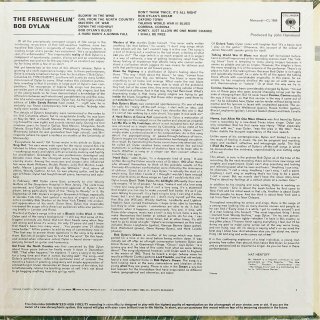 Éamonn Ó Catháin has found a copy on eBay with the same labels but where the sleeve has no folded-over flaps (which is a mystery - see the comments about the sleeves of Philips-made copies below). 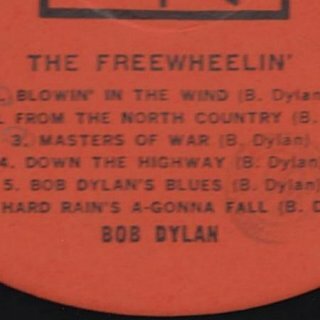 This eBay copy has matrix numbers: Side 1 - 62193-1A-1, Side 2 - 62193-1B-1, so it's definitely a first pressing. 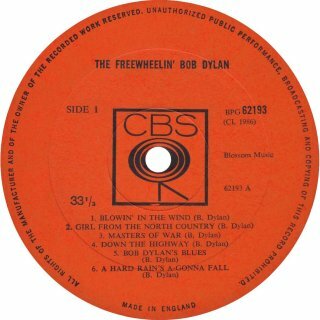 Stuart Leitch has an alternate copy of the CBS pressing with the rear sleeve with the three folded-over flaps where the song titles on the record labels are lower than on the labels of Hans Seegers' copy. 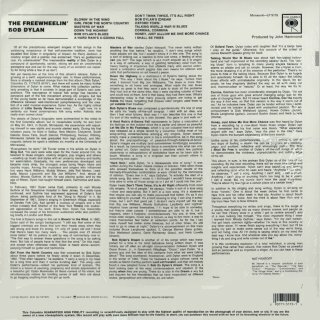 This copy has matrix numbers: Side 1 - 62193-4A-1, Side 2 - 62193-3B-1. 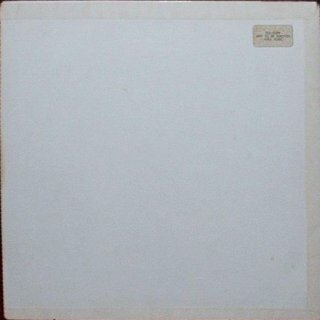 Rod Macbeath has found a unique copy on eBay with a blank rear sleeve. 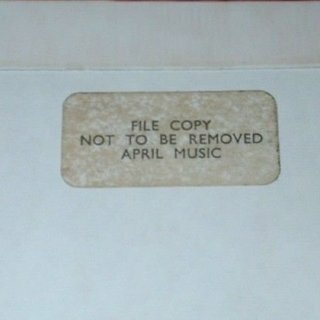 This copy has a sticker on the rear from April Music and a "SAMPLE RECORD" sticker on the Side 1 label. 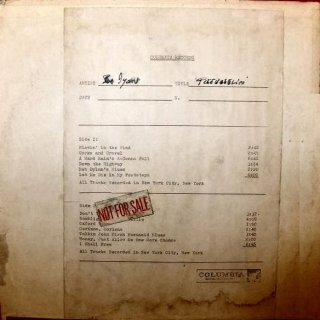 The label style is similar to that of Stuart Leitch's copy. 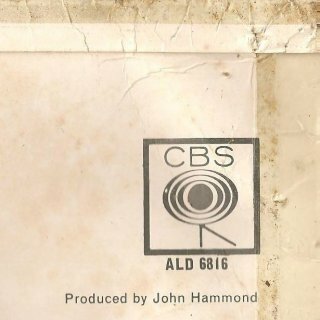 Arie de Reus has a copy manufactured for CBS by Philips. 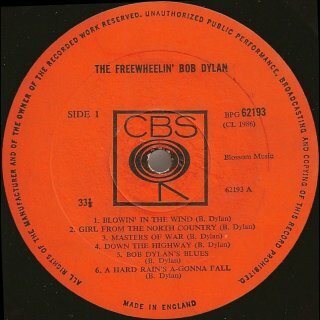 The sleeve (not shown) has no folded-over flaps and the vinyl is thicker than on a CBS-manufactured copy. 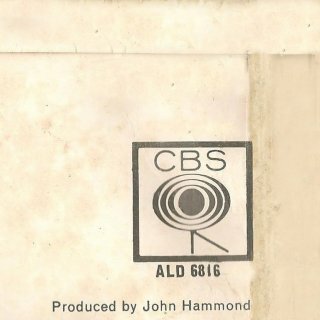 The Philips record labels have the earlier text "RECORDING FIRST PUBLISHED 1963" to the right of the centre CBS logo, while the CBS label has "(P) 1963". 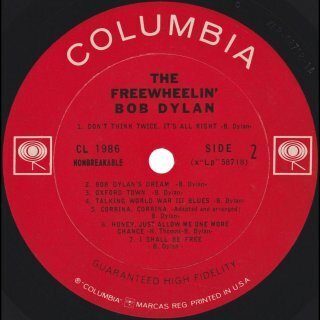 This implies the Philips pressing is earlier. The playing speed is shown as "33" and the type face is the same as the first and second CBS copies above. 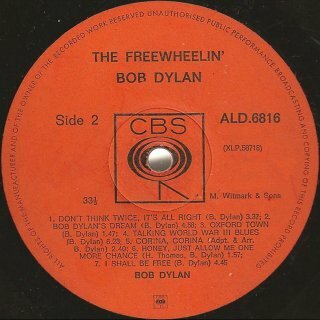 The record matrix numbers of Arie's copy are: Side 1 - BPG 62193 1L V 1=420 1 A 8, Side 2 - BPG 62193 2L V 1//420 1 1 9 ("V" is actually an upside-down triangle). 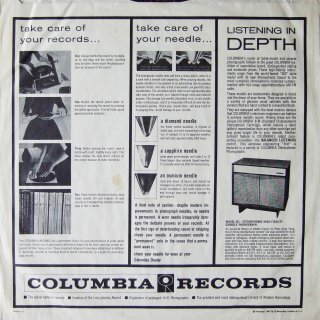 The sleeve of Gerd Rundel's Philips-made copy has two folded-over flaps on the rear sleeve as shown and the record matrix numbers are: Side 1 - BPG 62193 1L V 1=420 1 A1, Side 2 - BPG 62193 2L V 1//420 1. There is no printer name as shown. 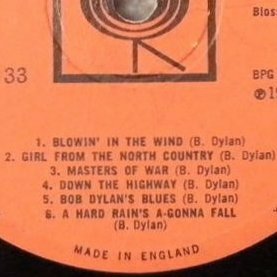 Matthew Watt-Smith has a Philips-made copy where the record matrix numbers are also: Side 1 - BPG 62193 1L V 1=420 1, Side 2 - BPG 62193 2L V 1 // 420 1. 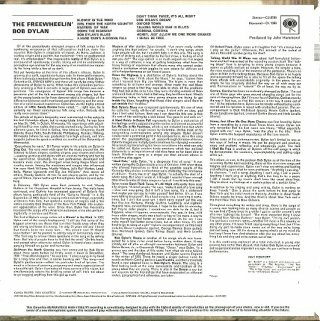 Matthew points out that www.discogs.com the entry for Philips-made copies of BPG 62193 says the sleeve has no folded-over flaps, like that of Arie's copy. 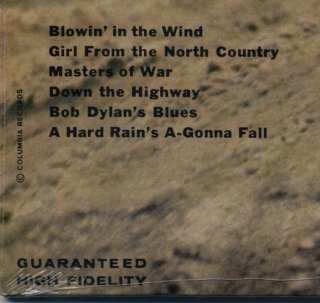 Either Gerd's copy is not in an original sleeve, or copies with sleeves with two folded-over flaps are also genuine. 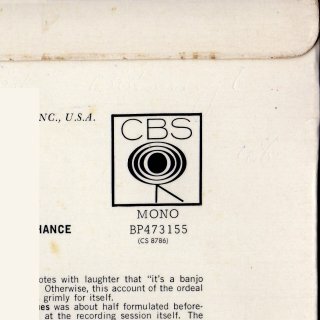 www.discogs.com also says that the original CBS-made sleeves have three folded-over flaps, like Hans' copy above. 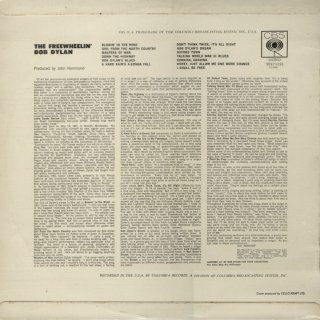 CBS BPG 62193 (UK) - front scan by Manuel García Jara (third/fourth CBS releases) Manuel García Jara has a CBS copy from 1968 with a different rear sleeve and record labels. The sleeve has no folded-over flaps. 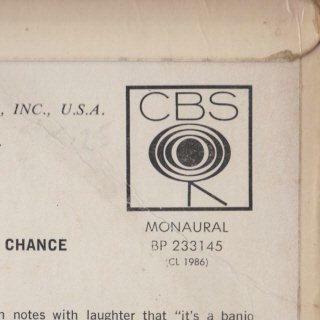 On the rear sleeve the catalogue number "62193" is now below the CBS logo at top right, and at bottom right the CBS copyright information has been replaced by the printer's name, Ernest J. Day & Co., Ltd. 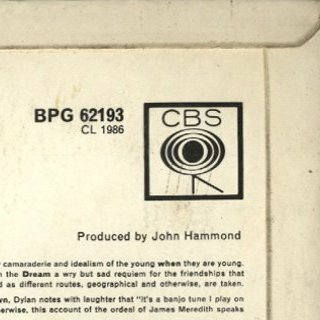 The record of Manuel's copy is in an orange/white CBS UK inner sleeve with details of contemporary CBS albums. 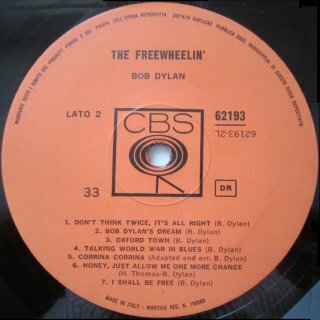 The record labels have text in a different type face, with the playing speed shown as "33⅓" and no publication date to the right of the centre hole. 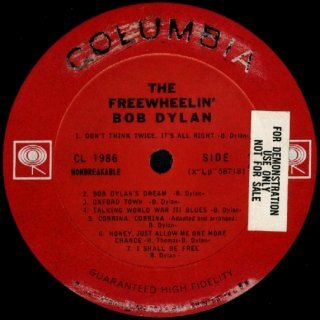 These record labels are the same design as those of the mono John Wesley Harding, released in 1968. 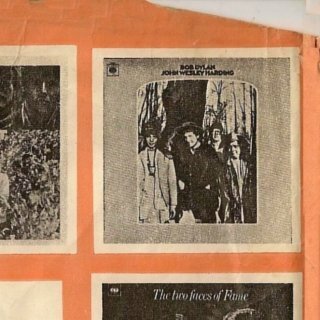 The inner sleeve front has illustrations of 1968 albums including John Wesley Harding. 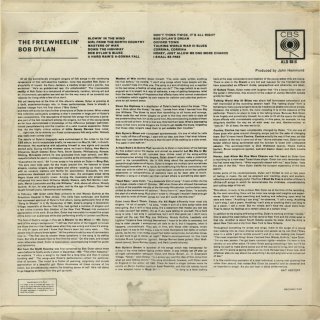 Gerd Rundel has a copy in the same sleeve but with a different inner sleeve from 1967, with an illustration of Bob Dylan's Greatest Hits (UK version, CBS 62847). 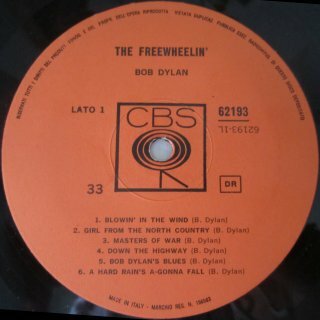 The record labels of this copy have "33⅓" in an earlier style, the same as the second release of CBS 62847. 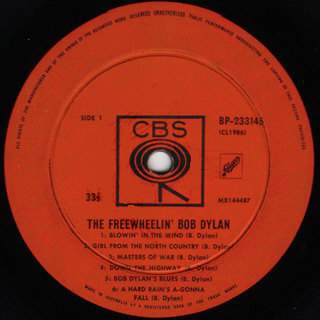 The record of this copy has stamped matrix numbers: Side 1 - 62193-4A-1, Side 2 - 62193-4B-1. 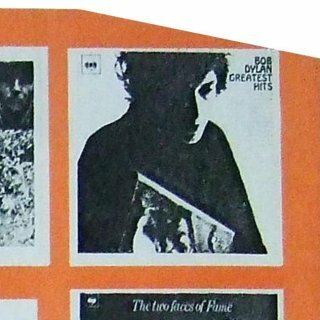 Thanks to Hans Seegers and Arie de Reus for information and to Hans Seegers, Stuart Leitch, Gerd Rundel and Manuel García Jara for scans. 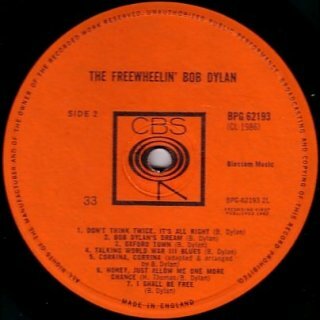 My UK mono copy bought in 1963 was stolen in May 1968. 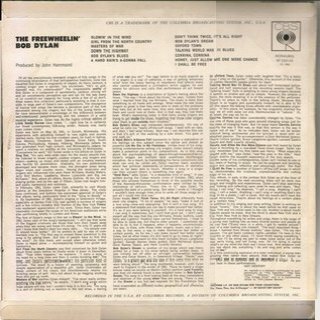 CBS 62 193 (France) - front scan by Hans Seegers (both releases) This is the mono version of The Freewheelin' Bob Dylan with a new title! This was the first Bob Dylan album to be released in France, in mono only. The very rare double-sided test pressing shown is dated 5 Apr 1965. 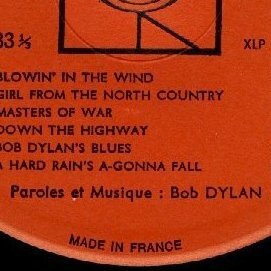 This album was never released in France on stereo vinyl, but for a 1973 French 8-track stereo release with this title, see International Album Releases (Regular). Manuel Rabasse has a copy with handwriting on the front. 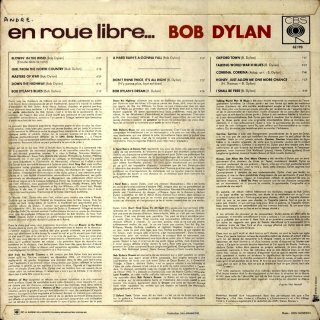 Just below "roue" is written "Mes premières chansons [My first songs]". 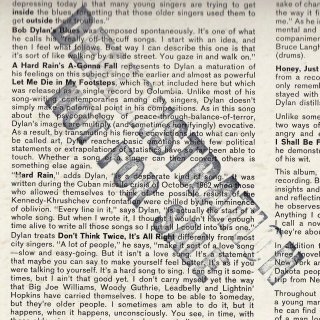 This is written in black marker pen on an outer PVC sleeve which is tightly wrapped around the sleeve and could be an ancestor of the more common shrink-wrap. 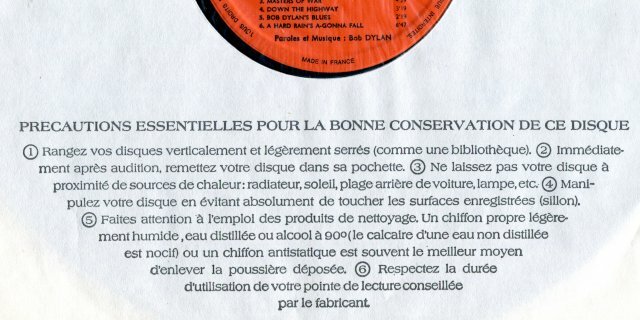 There also seems to be a missing square of plastic just below the word "chansons". The right edge has "DILLARD et Cie. Imp. 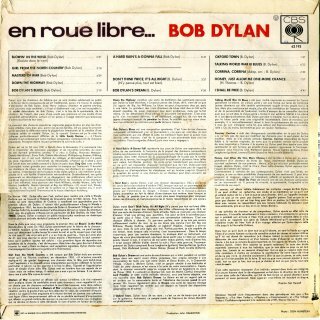 Paris", "Imprimé en France [Printed in France]" printed vertically upwards and "BOB DYLAN" in red. 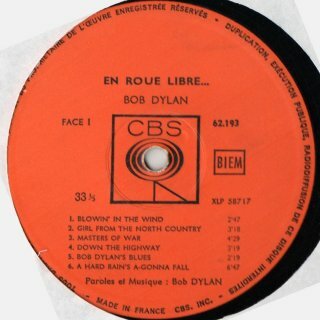 The right edge has "PRINTED IN FRANCE" (in English) printed vertically downwards and "BOB DYLAN" in very dark-red. 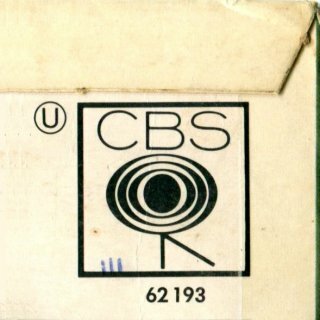 Senne Willems and Sergio Mariano Romay have copies of this variant with a "U" in a circle next to the CBS logo at top right, missing from Hans Seegers' copy. 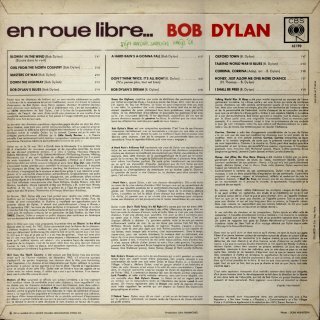 The sleeves notes are in French. 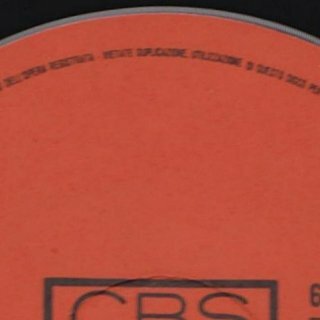 The record has orange CBS labels. 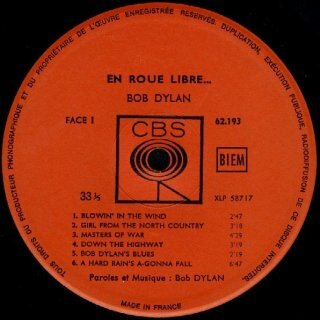 There are two label variants - Hans Seegers' copy has just "MADE IN FRANCE" at the bottom but Simon Blokker's copy (which also comes in the first variant sleeve with "DILLARD et Cie. Imp. 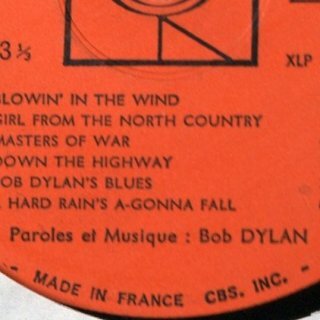 Paris" and no "U"), has "MADE IN FRANCE CBS. INC.". 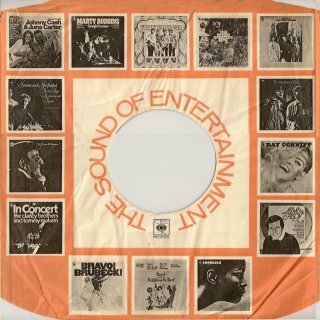 Sergio Mariano Romay has a copy which comes in the second sleeve variant with a "U" at rear top right, but the record has first variant labels with just "MADE IN FRANCE" at the bottom. 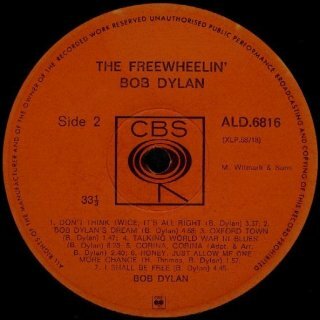 The record of this copy has stamped matrix numbers: Side 1 - CBS 62193 LPL 3383 380, Side 2 - CBS 62193 LPL 3384 380. 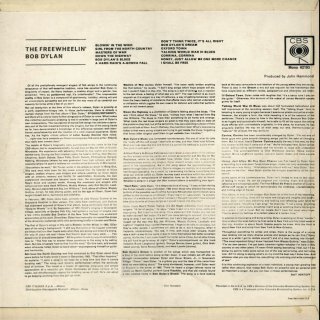 It comes in a white paper inner sleeve with French text about caring for the record. Thanks to Hans Seegers, Arie de Reus, Senne Willems, Simon Blokker and Sergio Mariano Romay for information and scans. CBS CL 1986 (Singapore/ Malaysia) - front photo by Jennifer Siedenburg This unusual album is probably from Singapore or Malaysia. 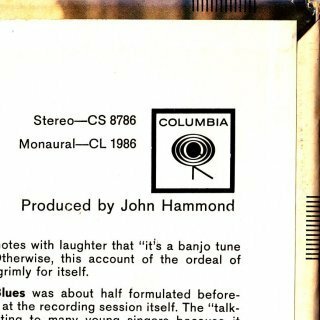 It comes in a US stereo sleeve with a black mono sticker at top front centre, and "CBS" stickers covering the Columbia logos on both the front and rear. 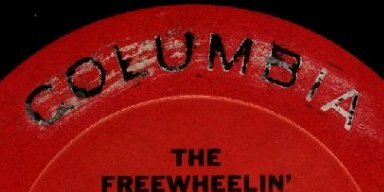 There is a number "1" on the rear sleeve at lower right, which indicates the sleeve was made by Modern Album Finishing Co., probably at their Terre Haute, IN, facility. 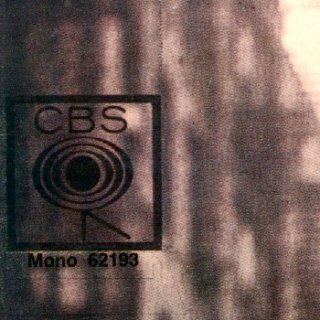 The record has red mono labels with three CBS logos with "MONO" and "360 SOUND" without arrows. 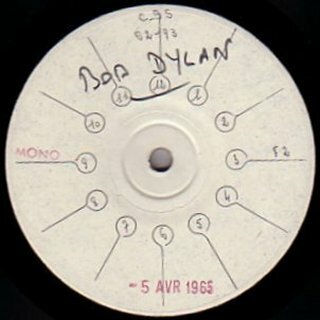 The record of the copy shown has handwritten matrix numbers: Side 1 - XLP-58717, Side 2 - XLP-58718. Thanks to Jennifer Siedenburg for information and photos. For the stereo version of this album released in 1967, see International Album Releases (Regular). CBS BP-2331145 (Australia) - front scan by Hans Seegers (variant 2) The front picture uses the UK crop. The front sleeve is laminated and the rear sleeve has two folded-over flaps top and bottom. 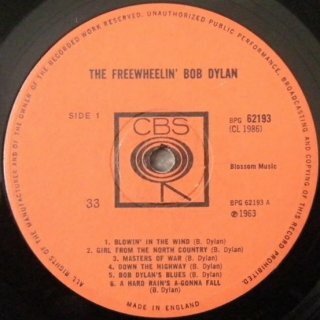 The record has orange CBS labels with the Allan's logo (Allan's were music publishers in Australia for Bob Dylan records between 1965 and 1969) and four variants are shown. 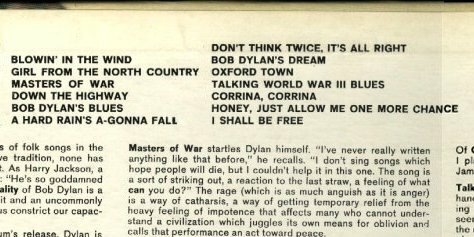 On the variants 1-3 Side 2 labels the credit for Corrina, Corrina is "Adapt. & arr. 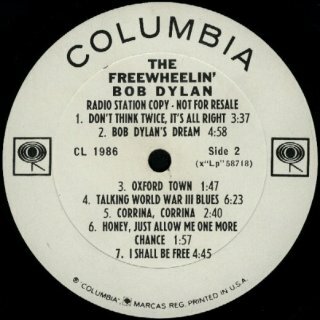 B. Dylan" on the same line as the song title while on variant 4 it is "Adapted and arranged B. Dylan" on a second line. 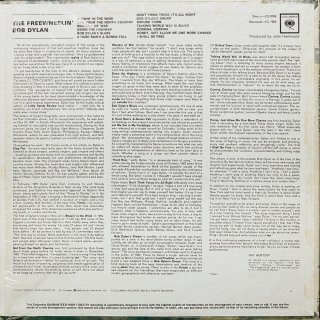 Stuart has a copy which may be the earliest (variant 1) where the song titles are printed in an italic style. 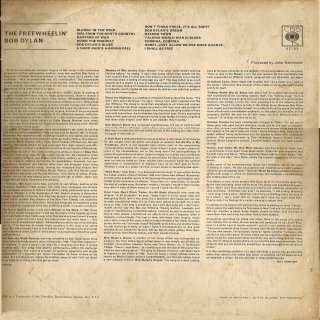 The matrix numbers are just: Side 1: "MX 144487", Side 2 - "MX 144488". 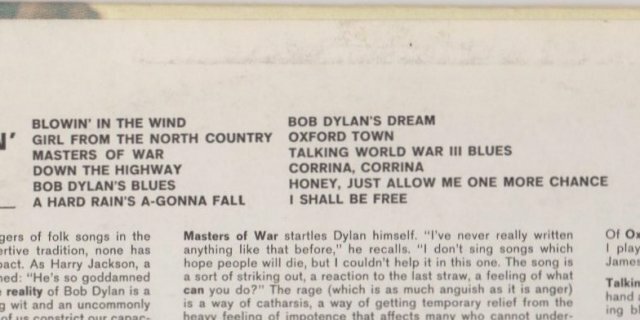 Hans Seegers' copy (variant 2) has non italic song titles and stamped matrix numbers: Side 1: "MX 144487-B BP-23145-1", Side 2 - "MX 144488-B BP-23145-2". 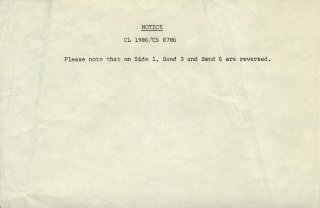 Stuart Moore has a copy (variant 3) similar to variant 2 but where the text elements are slightly differently arranged. 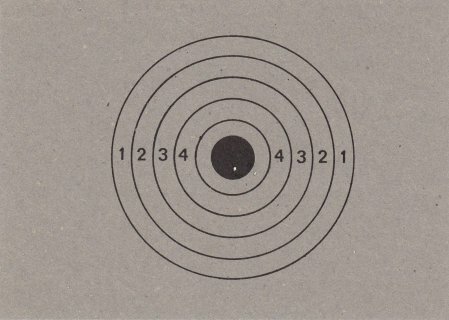 Stuart Moore's last copy (variant 4) has the same matrix numbers as variant 2 but the labels have a smaller "Allan's" logo to the right of the centre hole (same size as the New Zealand logo, see below). 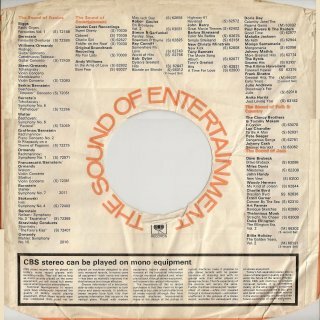 All the record labels shown have round the circumference at the bottom the text "MADE IN AUSTRALIA BY A REGISTERED USER OF THE TRADE MARKS" without a CBS copyright. 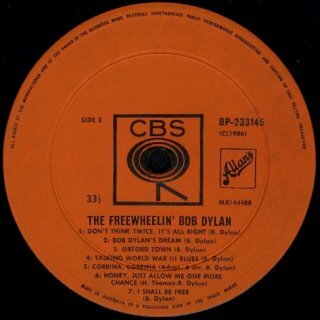 This is because up to 1977 all Australian records were manufactured by the Australian Record Company (Pty) Ltd. (A.R.C.) 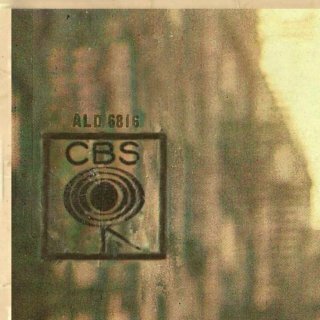 on behalf of CBS. 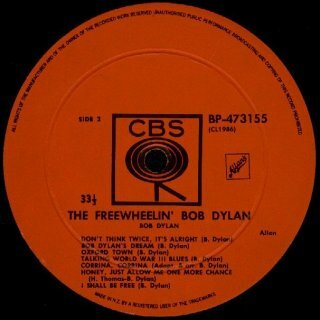 Thanks to Hans Seegers and Stuart Moore for information and scans. CBS BP-473155 (New Zealand) - front scan by Hans Seegers The front picture uses the UK crop but it's unique in having a white border. The sleeve has two folded-over flaps top and bottom. 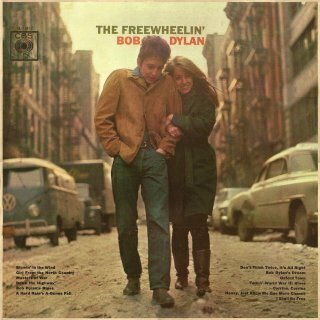 For the stereo release of this album, SBP-474237, see International Album Releases (Regular). 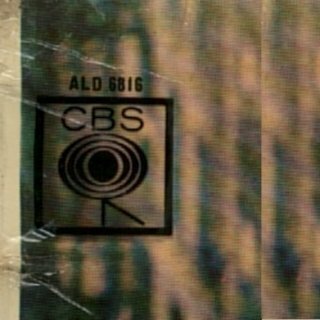 As with the Australian release, the record has orange CBS labels with the small Allan's logo (then the New Zealand music publishers as well) and stamped matrix numbers: Side 1 - "M.X 144487 BP233145-1", Side 2 - "M.X 144488 BP233145-2". 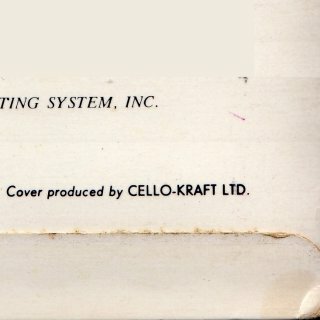 The sleeve was made in New Zealand by Cello-Kraft Ltd., and the record was made in New Zealand also. 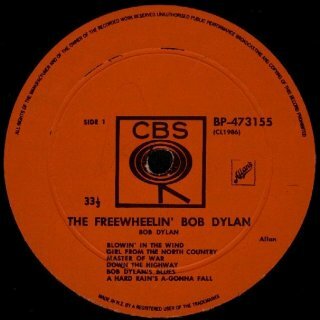 For the stereo version of this album, CBS ASF 1717, released in 1972, see International Album Releases (Regular). 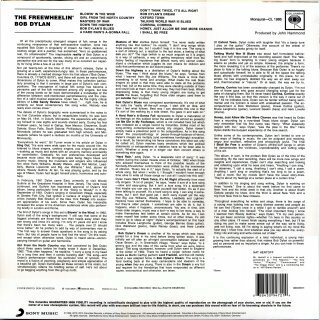 The sleeves of all three albums shown here look identical. 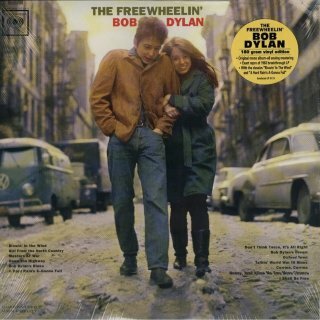 The album sleeve is laminated on the front and has two folded-over flaps on the back. 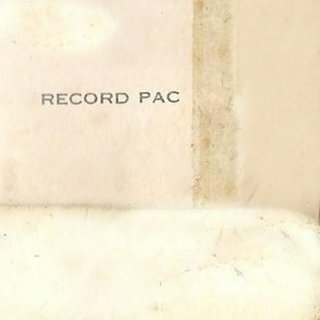 It was printed in South Africa by Record Pac. 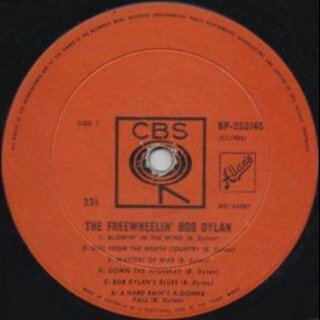 The records have orange CBS labels. 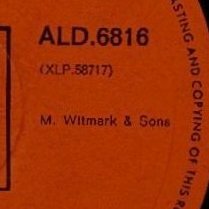 There are two variants of South African record labels, with "M. Witmark & Sons" positioned differently to the right of the centre hole. 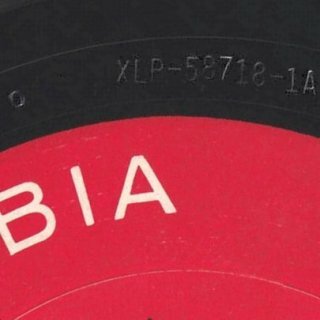 Both records shown have stamped US matrix numbers: Side 1 - "XLP-58717-3AD", Side 2 - "XLP-58718-2AB". 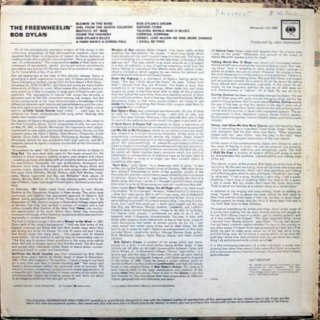 The Rhodesian album has the same sleeve as the South African releases. 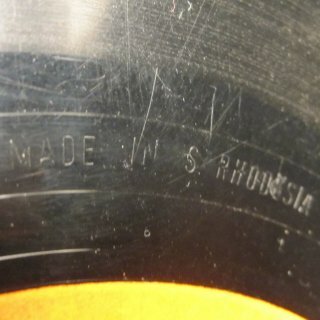 The copy of the record shown has stamped US matrix numbers: Side 1 - XLP-58717-3AC, Side 2 - XLP-58718-2AB 1, as well as "MADE IN S. RHODESIA" stamped on each side. 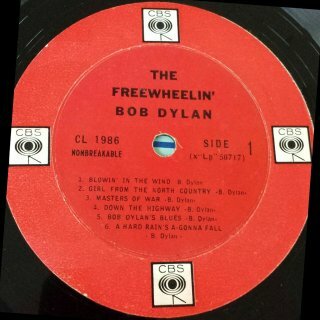 Thanks to Hans Seegers, Manuel García Jara and Senne Willems for information and scans. 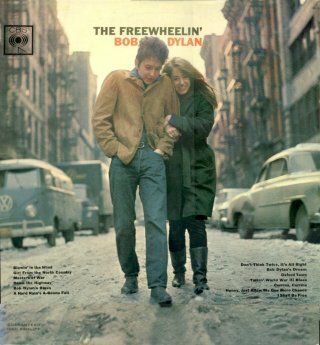 For the stereo version of this album released in 1975, see International Album Releases (Regular). 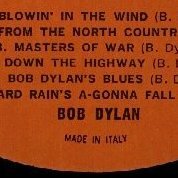 All four Italian mono releases have the same sleeve. The front is laminated and the picture uses the UK crop. The rear sleeve has two folded-over flaps top and bottom and a laminate line on the right edge. 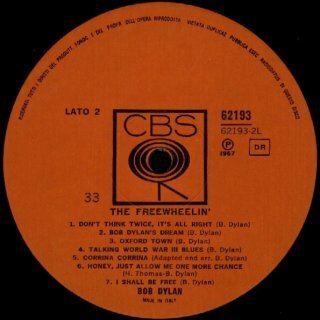 All the records have orange CBS labels. 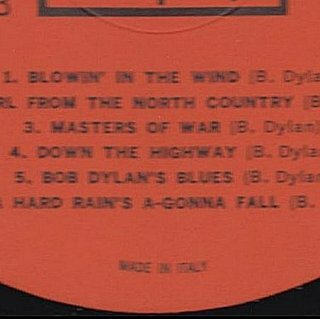 The 1966 labels have the album title and "BOB DYLAN" above the centre hole and "MADE IN ITALY - MARCHIO REG. 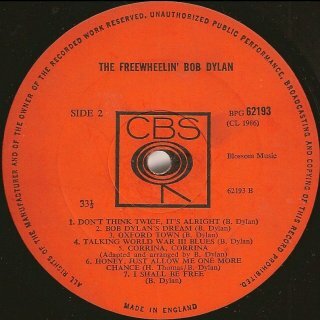 n. 156583" at the bottom, both variants of the 1967 labels just have "MADE IN ITALY". 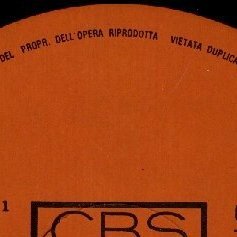 The record of Giuseppi Orlandi's 1966 copy has matrix numbers: Side 1 - 7/10/66 CBS 62193 1/L, Side 2 - 7/10/66 CBS 62193 2/L ("7/10/66" - 7 Oct 1966 - must be the mastering date). 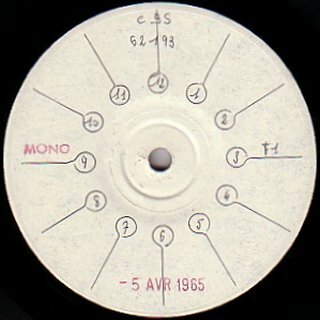 The labels of Lars M. Banke's 1967 variant 1 copy again have the album title above the centre hole and are dated "(P) 1967" to the right of the centre hole, as shown for Hans Seegers' 1967 variant 2 copy. The record has stamped matrix numbers: Side 1 - CBS 62193 1L 7/10/66, Side 2 - CBS 62193 2L 7/10/66 ("7/10/66" is still the mastering date). 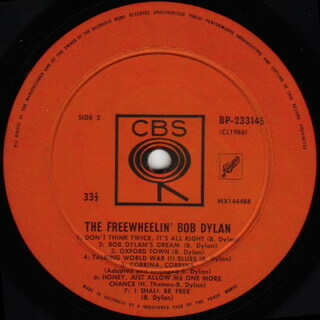 Hans Seegers' 1967 variant 2 copy has record labels again dated "(P) 1967" as shown but now the album title and "BOB DYLAN" are below the centre hole, with no text above. 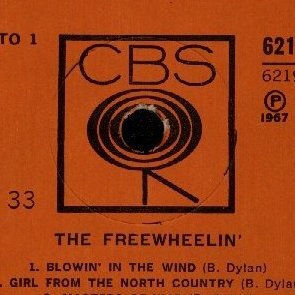 The record has stamped matrix numbers: Side 1 - CBS 62193=1L 7/10/66, Side 2 - CBS 62193=2L 7/10/66 ("7/10/66" is still the mastering date). 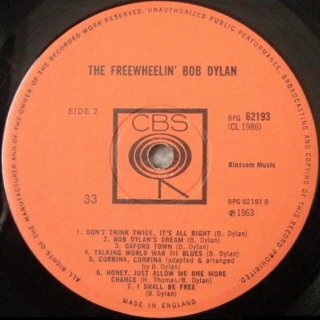 The labels of Lars M. Banke's 1972 release again have the album title and "BOB DYLAN" below the centre hole. 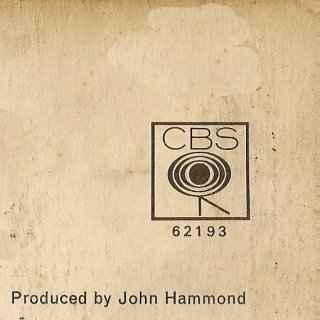 "MADE IN ITALY BY CBS SUGAR S.p.A." is now in the circumference text to the right of the centre hole. The record has stamped matrix numbers: Side 1 - CL 62193 1L 9/10/72, Side 2 -CL 62193 2L 9/10/72. 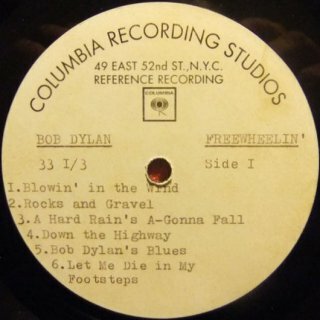 The mastering date is now "9/10/72" (9 Oct 1972). Thanks to Hans Seegers, Giuseppe Orlandi and Lars M. Banke for information and pictures. 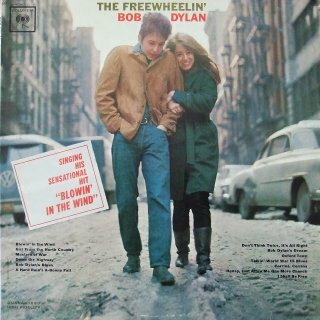 This mono album is claimed to be the rarest Bob Dylan album in the world, rarer even than the withdrawn first pressing of The Freewheelin' Bob Dylan (see 1963 and above)! 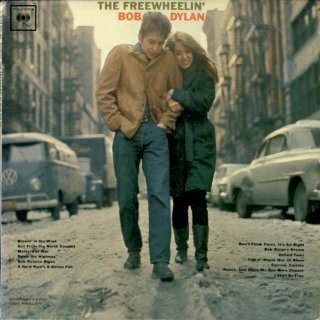 Its contents are actually the regular commercial release of The Freewheelin' Bob Dylan, with German "socialist" sleeve notes, released as a very limited edition by an East German record club, and printed at the Amiga pressing plant in East Berlin, under licence from CBS Records. 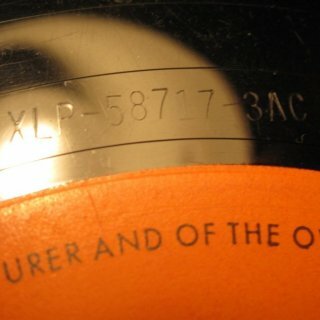 The record has orange "Phonoclub" labels. 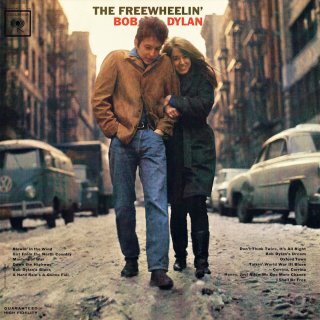 The front photo is a 1965 shot by Jerry Schatzberg. 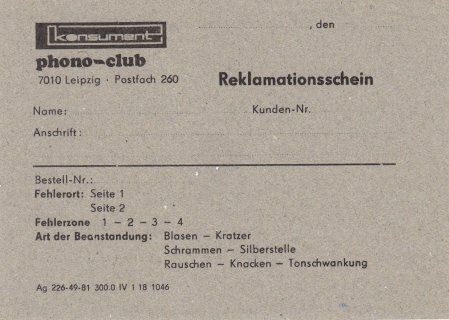 Gerd Rundel's copy comes with a "Replacement Card" that allows the buyer to send back a faulty LP for a replacement. 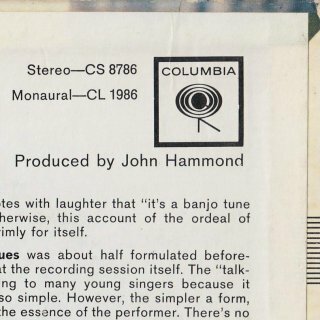 The "target" on the reverse of the card is where you indicate the location of the damage to the LP (my local public library in the 1970s used similar cards for recording LP scratches). 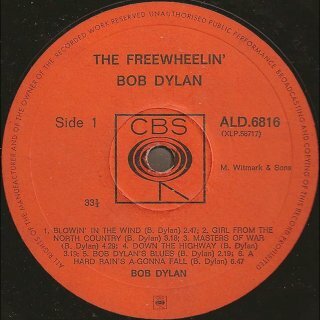 Thanks to Ronald Born for pointing out that this dates from 1981, and was not part of the original release. At that time the Amiga Phonoclub only sent stock copies of conventional Amiga releases to its members. 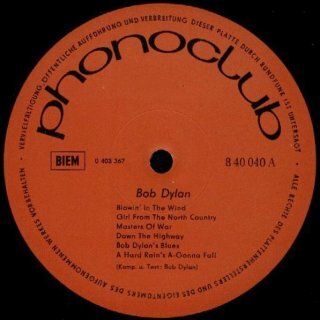 "Club editions" with the legendary Phonoclub labels were only released in the 1960s. 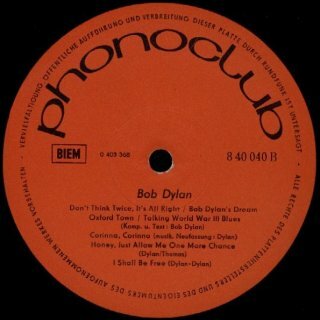 This Dylan LP was the only "Phonoclub only" release! All other albums were later also released as "normal" Amiga releases with the more common Amiga labels and the same sleeves. 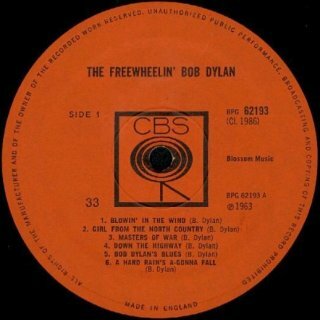 Ronald has a worksheet from the Amiga archive relating to Side 1 of this release, which shows that Amiga received a mono tape copy (on BASF tape) of The Freewheelin' Bob Dylan from CBS in Frankfurt/Main in the summer of 1966. 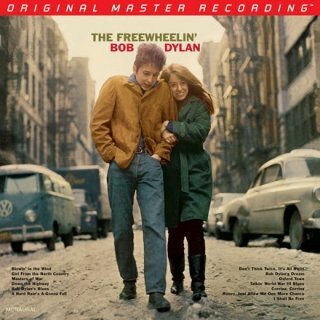 On 8 Jul 1966 two sound engineers edited the tape (which was two hours long! 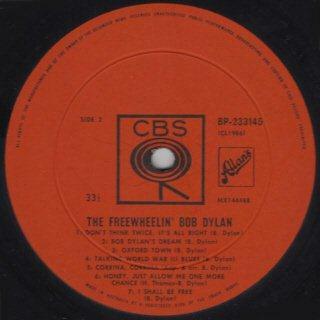 ), and a few days later on 19 Aug 1966 the management gave their O.K. for the release. 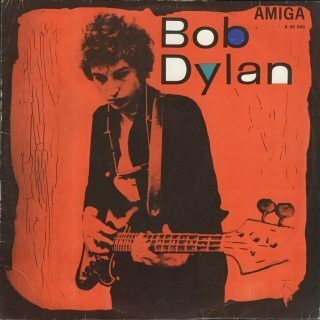 Thanks to Michel Pomarede for news that copies of this album in both red and black vinyl are being sold on eBay and other outlets. My information is that these are unofficial reproductions, so are not recommended unless you are keen to own such a copy for its novelty value. 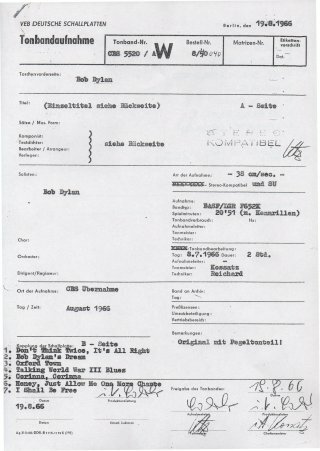 Thanks to Hans Seegers, Gerd Rundel and Ronald Born for information and scans. Columbia/Sony Music 88843094721/CL 1986 (Europe) - front with sticker (my copy) This heavyweight 180gm mono vinyl release includes the mono CD version of the album (the 2010 remastered version from the CD set below) and also an MP3 download. 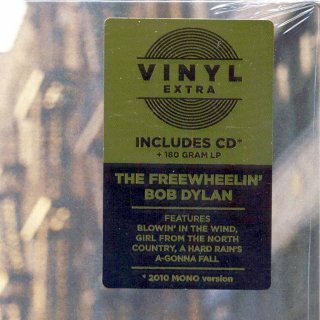 There is a gold/black information sticker on the front shrink-wrap. 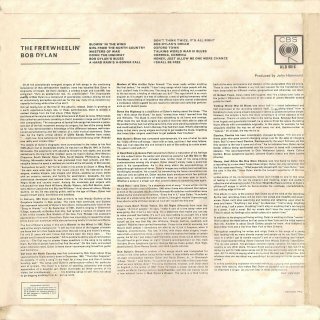 The album comes in a clear plastic lined plain paper sleeve with cut-outs for the labels and the CD also comes in a clear plastic lined plain paper sleeve with a front cut-out. 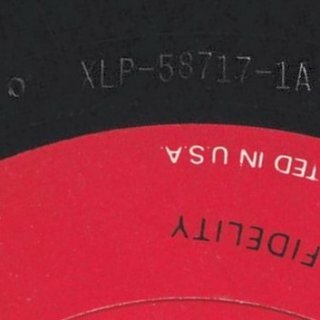 The rear sleeve has the Sony Music logo at bottom left and a barcode plus the new catalogue number at bottom right. 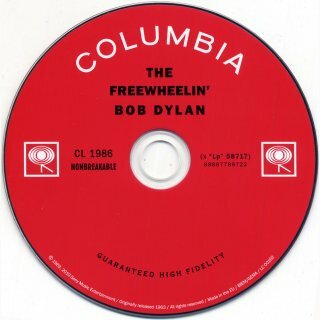 There are two variants of the CD, which has the catalogue number 88697789722. 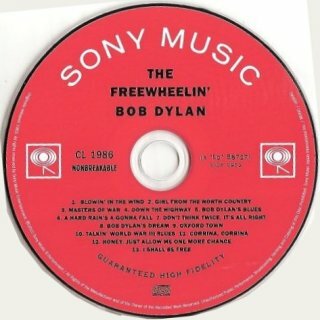 One has Sony Music copyright text round the bottom edge and the other does not. 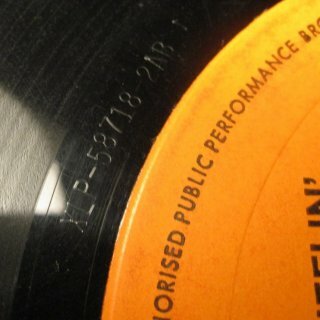 My copy of the record has (beautifully) handwritten matrix numbers: Side 1 - 88697761051-LP2-A, Side 2 - 88697761051-LP2-B. 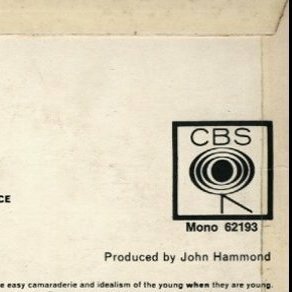 This number bears no relation to the catalogue number on the sleeve or labels! Mobile Fidelity Sound Labs MFSL2 459M (USA) - front picture from www.musicdirect.com Thanks to Éamonn Ó Catháin for information about this new mono vinyl release from the US audiophile company Mobile Fidelity Sound Labs. 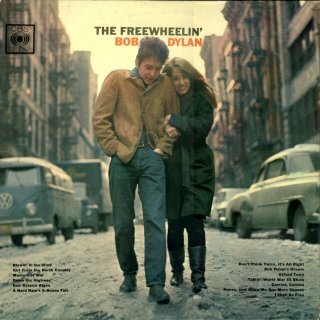 This high quality audiophile album comes on two LPs and plays at 45rpm. 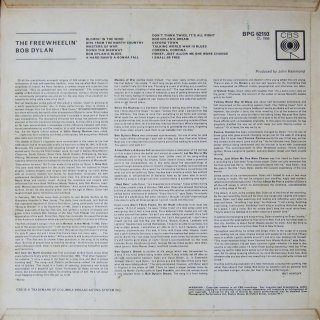 Columbia/Legacy/ Sony Music 88697761042 (Europe) - front of outer box with sticker (my copy) This set of Bob's first eight albums in the original mono mixes comes in a cutaway card box inside an outer box. 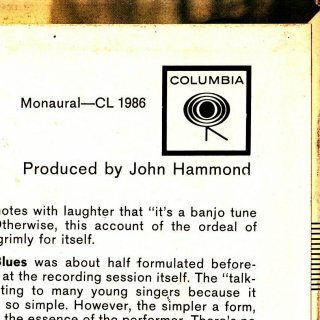 The CD albums are in thick card sleeves reproducing the original mono album artwork, in this case Columbia CL 1986. 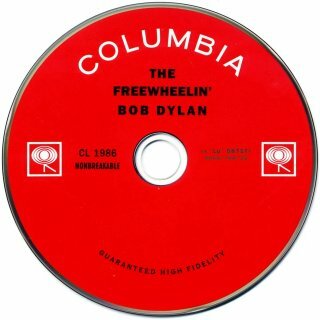 The CD comes in a contemporary inner sleeve and its design is based on the original Columbia design (see above). Thanks to Éamonn Ó Catháin for information that this album can be downloaded in MP3 format from Play.com in the UK for £6.99 or £0.89 per track. For full details of the set, see here. 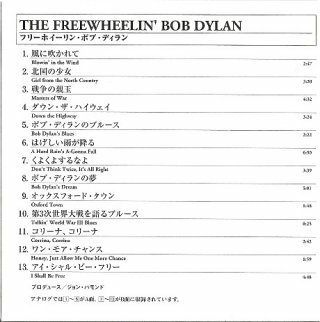 Thanks to Sonny Boy McFitzson for information about the Japanese release, Sony Music SICP 2151-59. It has a wrap-around obi with price ¥18,900 (¥18,000 plus sales tax). This has been reduced from the originally announced price of ¥25,000! 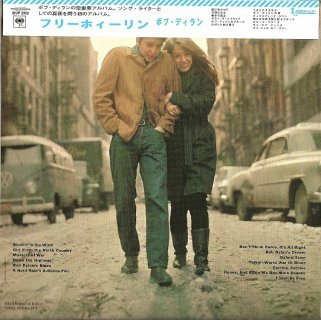 As the original mono albums were never released in Japan, each has a light blue top obi based on those of the original stereo releases. 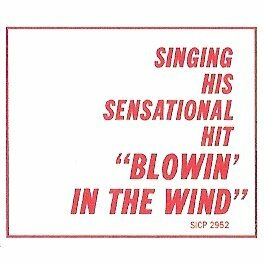 The Japanese CD also comes in a contemporary inner sleeve with a Japanese language booklet and an insert reproducing the original 1963 sticker promoting Blowin' In The Wind (see above). 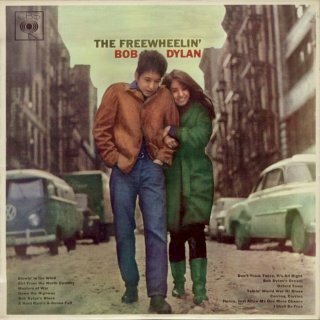 The 12" mono LP is available separately from the vinyl boxed set as a Dutch release, Music On Vinyl MOVLP 240 (NL), see above. 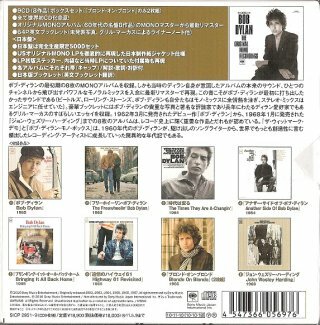 Thanks to Anthony Perry for information and scans. 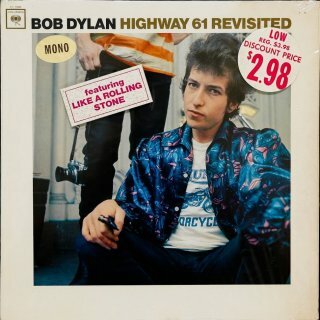 This mono CD comes with the remastered 180gm mono vinyl album above. 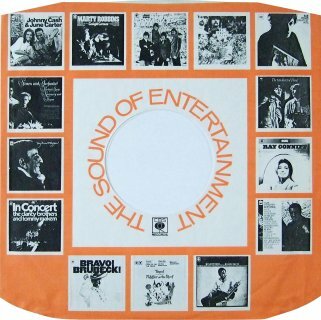 The CD comes in a clear plastic lined plain paper sleeve with a front cut-out. There are two variants of the CD, which has the catalogue number 88697789722. 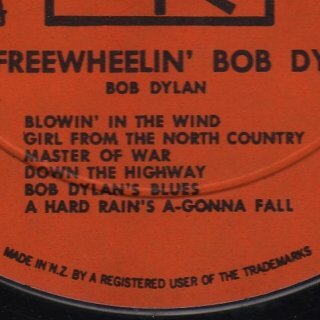 One has Sony Music copyright text round the bottom edge and the other does not. 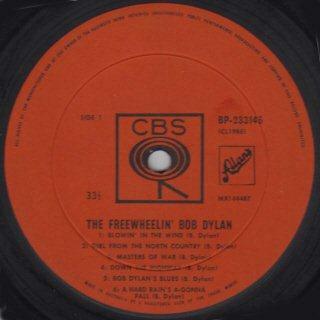 Mobile Fidelity Sound Labs CMFSA2178M (USA) - front picture from www.musicdirect.com Thanks to Éamonn Ó Catháin for information about this pending mono hybrid SA-CD release from the US audiophile company Mobile Fidelity Sound Labs. 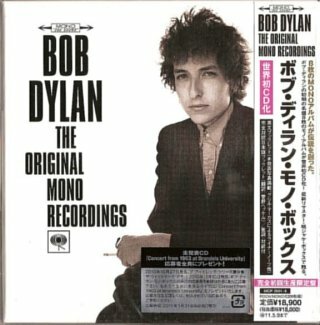 There will be a simultaneous release on hybrid SA-CD and vinyl of seven Dylan mono albums excluding Blonde On Blonde.